As the race to be the first person on the moon gathered pace, Innocenti's new model was launched, the Luna range (Luna meaning silver moon). The machines looked very advanced for their day, reverting back to the open frame style of the much admired 'D' types, and although sales were slow to start with, racing success from grass tracking to circuit racing, soon made them a sales success. Designed by Bertone Innocenti wanted a small frame and engine Lambretta that could be sold along side the larger models. The frame was tubular steel front end, with bolt on leg shields, and a monocoque pressed steel rear frame. 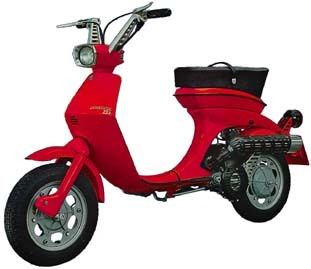 Engine wise two versions were available in terms of size, 50cc and 75cc. Model wise you could choose from the J50C, J50CL and J50S for the smaller 50cc models, and the J75S and J75S Cometa for the bigger engines. For the Italian market the models were called Lui, all export markets on the 75cc versions were called Vega or Cometa, the latter being distinguished mainly by featuring "lubematic" an oil injection system for the fuel system. The J50 C was the base model, both the C and the CL featured a 49.8cc engine, three speeds, producing 1.48hp, through a box type exhaust. 3.00*10 inch tyres sat on wheel rims made from cast iron alloy, braking was finned drums front and rear. Both models saw a short dual seat type design, which was really only capable of seating one person. The C had chromed bicycle handle bars and a bolted on front and rear light unit, while the more luxurious CL gained the more common Lui / Vega cast handle bars, with built in light unit. The floor boards of the CL gained rubber mats. The J50S was basically the smaller version of the 75cc models, with longer bench type seat, the same cast handle bar and light unit, and round rear light. It should be noted all the 50cc versions only featured a one beam main headlight! The Vega was the most popular model (in the UK), with an engine known as 75S (75cc), with the other model being known as a Cometa. The Cometa's engine was the 75SL, which was a 'lubematic', quite simply meant you did not have to have a petriol mixture as with all previous Lambretta's, as the oil was put into a separate tank which made its own way into the engine. A new sporty up and over exhaust was utilised, complete with a matt black heat shield. 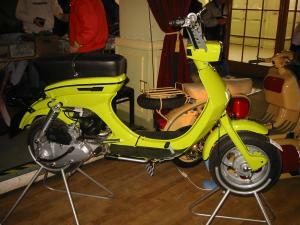 Main and dipped beam were added to the 75cc models, along with a rear brake light. A dual seat was fitted as standard, with a rear rack and indicators being available as an optional extra. A small chromed I badge was fitted to the leg shields just underneath the head set. For the home Italian market the models were only available in orange or silver and wore a Lui badge. For export markets, green, turquoise and red were added to the colours available, and the Lui badge was replaced with an item with the model "Vega" instead. All in all the Lui/Vega range was not a hugh success for Innocenti, probably with styling way ahead of its time, and the general demise of two wheeled sales around the world due to cheap small cars being available saw the range cease production in June 1969. No one can doubt the looks of the model, even today whether you love it or hate it, the Lui / Vega range could still pass as a modern machine.